Conquer Overwatch's latest control map. Control maps tend to have some of the most exciting fights and interesting compositions you’ll see at all levels of competitive Overwatch. Since they’re designed to have teams trade off as offense and defense throughout the match, the significance of each play becomes magnified, often resulting in clutch holds and heroic ultimates. The newest control map, Oasis, offers an even more dynamic experience on its three control points, with a jump pad, tunnel and plethora of obstacles to use as you see fit. Of the three maps you’ll play on Oasis, City Center is probably the most hectic. Its circular presentation full of entry points, long hallways and walls forces attackers and defenders alike to develop creative strategies for securing a victory. Oh, yes, there’s also a jump pad and elevated platform that overlooks the control point, as well as a central gazebo that can serve as a major help or hindrance from one second to the next. There really isn’t a bad DPS character pick on City Center because of its unique layout. Mei can wall off sections of the center area. Junkrat’s AoE spam can be devastating. Reaper, Tracer and Genji can go crazy with the flanking avenues. Even a smart Bastion or Torbjorn can help with area denial or anti-air. At OGN Apex Season 2, some teams have been running successful 'Pharmercy' compositions on City Center. Pharah really shines on this map since she can take advantage of choke points and circumvent enemy cover with remarkable ease. Watch as Flow3r from LW Blue drops on Lunatic-Hai with deadly results. Tanking and healing are a bit of a different story. Though Reinhardt and Zarya are never bad tank picks, Winston and D.Va might give you a bit more bang for your buck. They’re both mobile and can get to the high ground much faster than the other tanks, and both of their ultimates are very effective given how confined the fighting space is. When it comes to healing, Zenyatta and Mercy might be better choices than Ana if she’s having a hard time with line of sight issues. Zen can just leave Orb of Harmony up, while Mercy can fly to where she’s needed. Let’s not forget how useful Orb of Discord and Resurrect can be in an all-out brawl for the point, either. 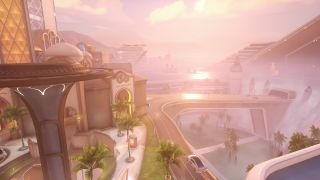 The University stage of Oasis should feel the most familiar to you, as it’s quite similar to Well on Ilios and Sanctum on Nepal. The capture point is surrounded by walls and high ground, making choke point management and exploitation crucial. However, there’s also a pit with a large health kit in the center which creates an interesting escape route for stealthy or quick characters. If you watch any pro match, chances are you’ll see a D.Va or Genji drop down there real fast to nab that health pack and get back in the fight. Regarding compositions, University is a very meta-friendly map. Tracer and Genji are dominant at controlling the choke points and abusing the walls and high ground. Afreeca Freecs Blue has one of the world’s best Genji players in Arhan. Pay attention to how confident his execution is in this play against Kongdoo Uncia. That’s about as classic as it gets for high-level Genji play. He jumps from the choke to the high ground and back again, sending three people to the respawn screen. Tanking University can be a classic affair if you want it to be. A basic 3/2/1 build revolving around Zarya can be quite strong with where the main entry points are located. So long as you have DPS building up ultimate meter fast enough, Graviton Surge setups could be an option worth exploring on the ladder. If you want to see perfect placement of a Zarya ult on University, check out the following setup by Kongdoo Uncia. Much like City Center, the Garden on Oasis has an elevated platform as well, only this time it’s right in the middle of the point. In fact, the control point has several tactical features including high arches, columns, hallways and a conal structure just outside of the main entrance. Needless to say, aggressive dive compositions work very well here. Reaper and Genji are pretty popular DPS choices on Garden because of how well they can take advantage of that elevated catwalk. Tanks will go down in a hurry if they’re able to keep up the pressure uncontested from the high ground. Likewise, Pharah is monstrous on this point due to aggravating line of sight issues and the potential to blindside her opponents with Barrages from awkward angles. Mei can prove to be invaluable since there are many doorways she can wall off or drop a Blizzard on top of. Winston and D.Va are once again very good choices for tanking Garden. With them on the field, you don’t have to worry as much about the high ground getting abused. Winston’s shield fits perfectly between the catwalk and the adjacent hallways, almost acting like an extra wall in the courtyard. Hanzo and Widowmaker can be effective at breaking defenses on Garden, but they have trouble holding the point once the fighting gets up close and personal. Communicate with your team and be willing to suicide off of the ledge if they want another hero that better suits their needs. Nothing’s worse than a stubborn sniper. Oasis is a superb map that allows for ladder-friendly builds to be successful at all levels of play. What’s perhaps most interesting with Oasis is that it puts the concept of “meta” on a gradient. Composition is still important, but individual skill and comfort level end up ruling the day. It’ll be interesting to see what maps Blizzard has in store for Overwatch, but if Oasis is any indicator, it’s safe to say that we’re in for some surprises that cater to all playstyles.